Mac OS (Classic) Lion Entertainment Inc. This page is for the original release. For the Megaton Edition, see Duke Nukem 3D: Megaton Edition. For World Tour, see Duke Nukem 3D: 20th Anniversary World Tour. 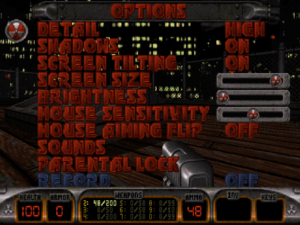 Duke Nukem 3D source code was released in 2003, making the game very mod-friendly. Regular or Atomic Edition. Atomic has a disc check (see Play without the CD). A shareware episode is available. The Atomic Edition includes the Plutonium Pak expansion. All digital distribution versions include the expansion. Duke Nukem 3D: Megaton Edition includes both the DOS Atomic Edition as well as an updated version that includes Duke Caribbean: Life's A Beach, Duke It Out In D.C., and Duke: Nuclear Winter. 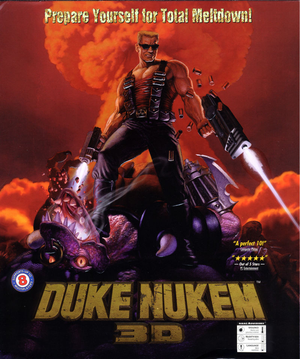 The version sold digitally by 3D Realms (as part of the Anthology Pack) included the Atomic Edition as well as Duke Caribbean: Life's A Beach, Duke It Out In D.C., Duke: Nuclear Winter, and Duke!ZONE II. This version is no longer sold. Included with Atomic Edition and all digital distribution versions. Included with the Megaton Edition. Includes all Duke!ZONE content along with 3 new episodes. Duke!ZONE II was just a shovelware user map compilation; most maps could be downloaded free online. Many more obscure, unauthorized expansions are available. See here for more info. All patches for the retail version can be found here. An old semi-official patch for OS X (PowerPC only) can also be found here. Digital distribution versions are already patched. bMouse will cause the vertical aiming to be inverted. 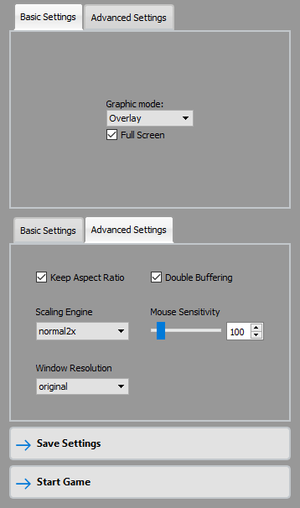 To fix this, set the mouse Y scale to a negative number in Control Setup and Setup Advanced Control Options. bMouse is a DOS extension which improves mouse looking by removing an engine limitation which would force to use one mouse axis at a time to aim. The Atomic Edition checks for files on the CD. Copy the CD contents to the installation folder. xDuke Straight port from the original DOS release that only adds a console and the ability to load music packs. hDuke Based off xDuke. Focused on multiplayer, it features extra parameters such as frag limit and an anti-cheat system. nDuke Base off xDuke. Similar to hDuke, it also features a team deathmatch mode. Icculus Duke3D Straight port from the original DOS release for all platforms. EDuke32 Adds many modern features to Build engine such as high and widescreen resolution, dynamic lighting and shadows and expands the modding capabilities. It doesn't properly support multiplayer yet. EDuke32-OldMP A multiplayer branch of an old EDuke32 build. All source ports (except later builds of EDuke32) will require to manually copy DUKE3D.GRP and DUKE.RTS into their root folders. 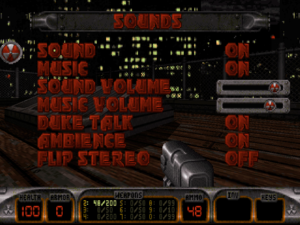 Soundtrack for Duke Nukem 3D recorded on an authentic SC-55 for use with EDuke32 or the Megaton Edition. Choose either OGG or FLAC; MP3 does not support proper looping. Both frontends support both the DOS release and all source ports. YANG - Also supports other Build game such as Blood and Shadow Warrior, as well as any DOS games run through DOSBox. Supported by EDuke32. See Source ports. Use EDuke32 and force using the Nvidia Control Panel/AMD VISION Engine Control Center. See Source ports. Use EDuke32 to remove the frame rate cap. See Source ports. Open the console (~) and enter r_pr_fov # with the angle to use. FOV can only be modified in Polymer render mode. Use EDuke32 XInput fork for better support. Available only in local retail stores. See Multiplayer frontends for extended features. Provided by EDuke32-OldMP. See Source ports and Multiplayer frontends. Download the EDuke32 build in this post and follow the instructions. Execute EDuke32 and set Input Devices to Keyboard Only, then exit. This will avoid mouse look to impede player 2 forward movement while keeping player 1 mouse look functional. Execute EDuke32 with the splitscreen parameters and remap player 2 keys in Control Settings. Red/blue anaglyph support was never finished. Broken in v1.5. ↑ 2.0 2.1 File/folder structure within this directory reflects the path(s) listed for Windows and/or Steam game data (use Wine regedit to access Windows registry paths). Games with Steam Cloud support may store data in ~/.steam/steam/userdata/<user-id>/359850/ in addition to or instead of this directory. The app ID (359850) may differ in some cases. Treat backslashes as forward slashes. See the glossary page for details. This page was last edited on 28 March 2019, at 00:09.